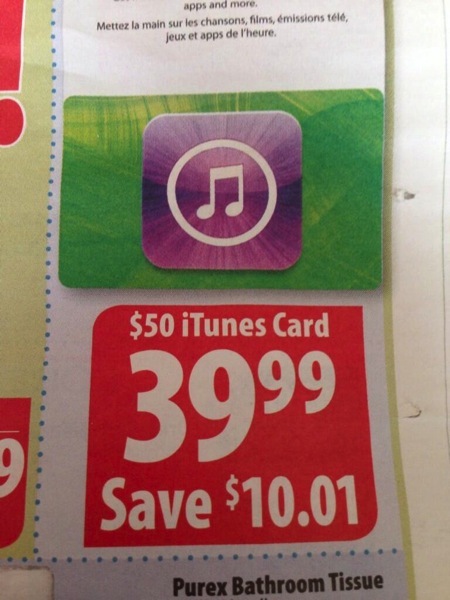 If you’re in the hunt for iTunes Cards, Western Canada retailer London Drugs is holding a $10.01 off sale starting today, as $50 cards are available for $39.99 until September 4. By funding your iTunes account with these 20% off cards, it gives every single one of your digital purchases from Apple a discount (App Store, iTunes, Mac App Store, iBookstore, in-app purchases, etc). London Drugs locations can be found in select cities within BC, Alberta, Saskatchewan and Manitoba. Update: there is also a sale at Future Shop stores–$60 iTunes Cards multipacks are 20% off at $48 (thanks @mcqsun99, @cfl_fan).